The Jungfrau, Monch and Eiger. There are few more iconic alpine peaks. The wonderland Bernese Oberland in Switzerland is home to all three, alongside the magical Lauterbrunnen valley and elegant ski resorts of Mürren and Wengen. My travel guide shows you how to pack the absolute highlights of this region into a perfect seven days. There are few places ever I’ve wanted to explore more than the Bernese Oberland. I remember being mesmerised as a small child by photos of the Lauterbrunnen valley, as my Dad projected his old slides onto our living room wall. 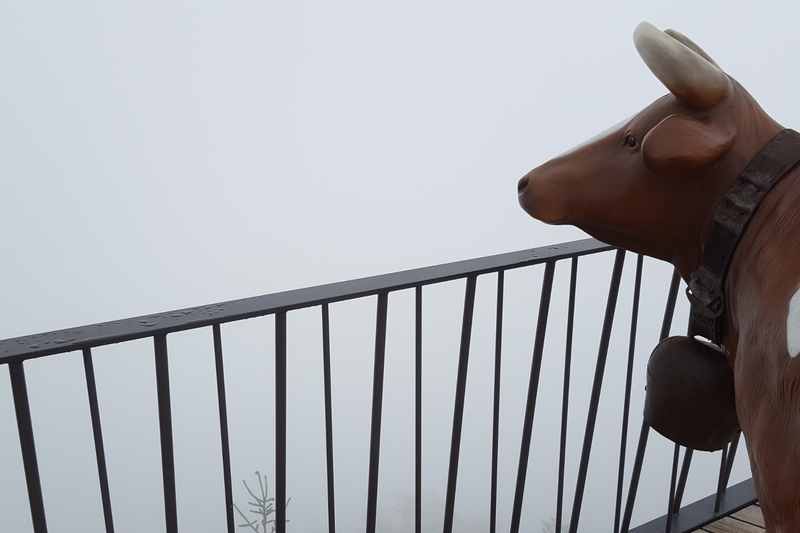 As I grew older and slowly started to explore more and more of the Alps, a yearning remained – to visit this mythical region of Switzerland that I’d heard so much about, but could only imagine. Whilst the name Bernese Oberland (or Berner Oberland to Swiss-German speakers) might not ring any bells, the extraordinary peaks and valleys of this area might be more familiar. From the imposing Eiger to the majestic Jungfrau, the magical Lauterbrunnen valley to the picture-perfect alpine resorts of Wengen and Mürren, breathtaking lakes Thun and Brienz to the cultural melting pot of Interlaken – it’s a bounteous region of rugged cliff faces, snow-capped mountain tops, sparking blue lakes and flower-filled meadows. You could spend a lifetime exploring these mountains, but you’ve got to start somewhere. So I bit the bullet, booked some flights last summer and set out to explore some of Switzerland’s grandest summits and most enchanting valleys. It didn’t disappoint. Whilst you can’t possibly pack in all the wonderful places to visit here into one week, I want to share my recommendations for the perfect introduction to the bewitching Bernese Oberland. Enjoy! 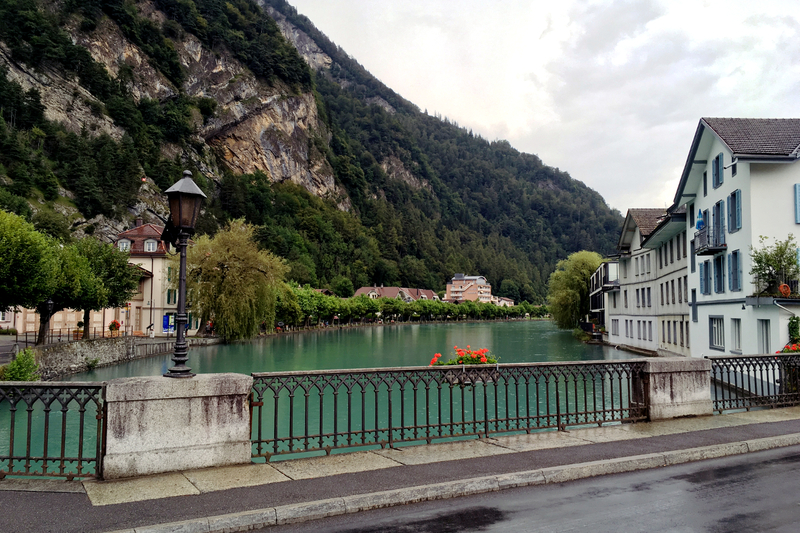 Arrive in Interlaken and explore the town. Stay in Interlaken. P.S. Planning a trip to this part of the world during the summer months? Check out my guide to packing (plus free printable packing list) for summer in the Alps. Any of Switzerland’s major international airports make a good starting point. Geneva and Zurich are a few hours by road and rail, and Bern is even closer. If you’re travelling by road from elsewhere in Europe, you’ll find the motorway network is fast and efficient. Interlaken is well-signposted from a good 100km or so away. We flew to Geneva with from London Gatwick with Easyjet, ready to pick up our next mode of transport. Despite its wild mountains and deep lakes, the Bernese Oberland is surprisingly easy to travel around. The Swiss know a thing or two about transport planning. Road and rail are your best options, and both are thankfully easy. For drivers, Interlaken is only 45 minutes by motorway from Bern. And once you’re off the motorway each of the valleys are well served by well-signposted A roads that are easy to navigate. It’s worth noting that the mountain resorts of Mürren and Wengen are both car free – it makes a lot of sense once you see their mountainside locations. However, the long stay car park in Lauterbrunnen can take of your car for a few days. It’s helpful next to the railway station, so you can hop on a train to your next destination. Switzerland is a rail traveller’s dream. The mountains and valleys of the Bernese Oberland are interlaced with railway lines served by frequent and punctual services. There are regular services to Interlaken from major Swiss cities, including Bern and Zurich, and international connections too. You can reach almost every mountain town and sizeable village in this region by train – but I’d recommend booking in advance wherever possible to save on what can be pricey tickets. We rolled our transport and accommodation into one with the help of the lovely people at Blacksheep campervans. We hit the road in our own little VW Caravelle for the week and took advantage of being able to park up in our campsites. There are three main options when it comes to accommodation in this part of the world; upmarket hotels, homely hostels and campsites. If hotel travel is your thing you’ll find Interlaken, Mürren and Wengen packed full of places to stay – from alpine style chalets in the mountain resorts to palatial-looking establishments encircling the common at the centre of Interlaken. 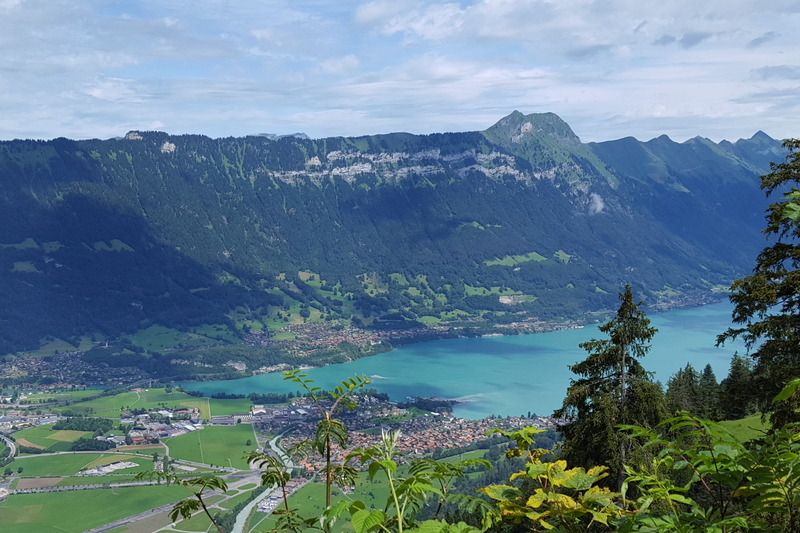 Most are independent businesses with the exception of one of two in Interlaken, giving you a chance to experience something a little different. You’ll also find a couple of large hostels in Interlaken with mostly dorm accommodation, and a smattering up in the mountains. Try the Swiss Youth Hostel Association to find out more. Then there’s my favourite option, camping. Whilst there are plenty of reasons why you might not be keen to camp in the mountains, the joys of camping here outshine any downsides by a country mile. The locations and views are breathtaking, the sense of peace immense and waking to the sound of tumbling waterfalls is quite magical. It’s also by far and away the easiest and best-value accommodation you’ll find in Switzerland. In a word, yes. But it really depends what you want to do. We love to walk and trail run, and had our own transport. Couple this with camping and it can be a surprisingly budget-friendly trip, with campsites costing between €20-€40 per night for two people (depending on whether you have a tent or campervan). The major expenses you’ll find here are a train travel, cable car travel, hotel accommodation and eating out. If you’re happy to seek circular walking routes, where you’re not reliant on public transport, exploring these alpine peaks and passes can be free. And given that the area isn’t renowned for great eating out, opt to self-cater if possible and take advantage of the two large supermarkets in Interlaken (Migros and Lidl) to stock up on the basics. There’s also a good supermarket and better value-for-money eating out to be found in Grindelwald. 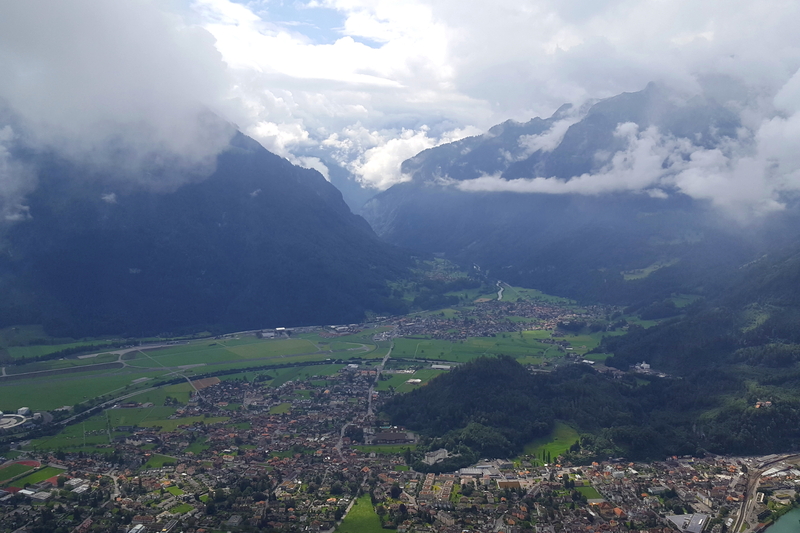 You’ll want to begin your adventures in Interlaken, the centrepoint of the region. This funny little town is one of the oldest resorts in the world and a transportation hub. Set in the lowland plains that stretch between Lake Thun and Lake Brienz, there’s plenty to see. The centre may be packed with hotels, shops and lost-looking tourists but there are pretty squares to be found in Unterseen, peaceful paths down by the river and enticing views up into the Lauterbrunnen valley. Think of it as a gateway to an alpine wonderland. Make yourself comfortable on day one, get settled in and get ready for exploring on day two. To give yourself a real feel for the area, spend your first full day on a journey to Schynige Platte, one of the impressive peaks that stand sentinel at the entrance to the Lauterbrunnen valley. From the top of Schynige Platte you can look down not only on the town of Interlaken, nestled between lakes Brienz and Thun, but also the Lauterbrunnen and Grindelwald valleys, with the mighty Eiger and snowcapped Jungfrau as a larger than life backdrop. Schynige Platte can be reached on foot in a day if you’re confident tackling some steeper climbs and tricky paths near the top. Alternatively, take the quaint mountain railway from Wilderswil. Snaking up the mountain, it first passes through fields and then forest until it breaks through the trees at the intermediary station of Breitlauenen. The station alone worth is stopping at, the charming old building and waiting room haven’t been renovated in living memory. The most joyous experience here though is to watch the lovely station master at work, whose main priority appears to be ushering free-range chickens and sunbathing cats off the line whenever the bell rings to warn of an approaching train. The train crawls around rocky outcrops on the final few kilometres of the line until it breathlessly takes one last turn towards the station at the peak and the magnificent view to be found here. You can read more about hiking the route to Schynige Platte in 4 breathtaking walks in the Bernese Oberland. If you spent yesterday walking, you’re going to want to give your legs a bit of a rest before tackling higher mountains during the rest of the week. Today is the perfect day to take in Interlaken from a different angle. Harder Külm is a smaller peak on the opposite side of the plain to Schnige Platte. There are lots of trails to explore on foot– all gentler than the yesterday’s climb. Alternatively, you can take the old-fashioned funicular all the way from the centre of Interlaken to the viewing platform and café at the top. Head to Lauterbrunnen in the afternoon and find your bearings in this little village of timbered chalets surrounded by alpine pasture. The valley of a thousand waterfalls is beyond spectacular, with cascades at every turn and steep cliff faces stretching high up from the meadows below. Stroll to the Staubbach falls on the edge of the village, where a short but steep path will take you underneath the waterfall itself, and if you’ve got time book a tour of the legendary Trummelbach falls – hidden within the walls of the valley itself. Whilst the rock faces and steep sides of the Lauterbrunnen valley look impregnable from below, there are little paths and mountain railways that wind up to the hidden villages perched up on the high alpine pasture. This side of the valley can be explored on foot or by a combination of cable car and railway with a little walking in between. From Stechelberg, a few kilometres walk from Lauterbrunnen, you can follow a steep walking route or take a speedy cable car to the idyllic village of Gimmelwald. 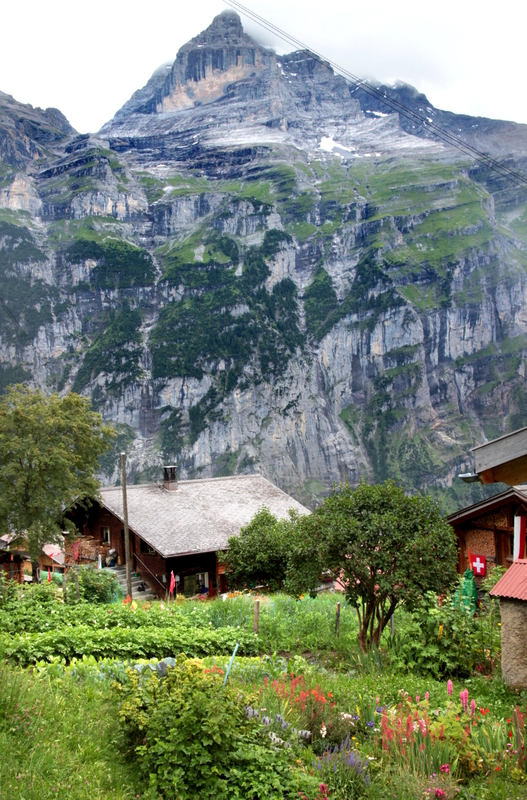 All picture-postcard Swiss chalets, luscious gardens and alpine cattle, Gimmelwald is alpine charm personified. Meandering a little further uphill takes you into the larger resort town of Mürren, where you can explore pretty streets, take a breather in one of the many welcoming cafes and restaurants and enjoy fantastic views of Wengen and the Jungfrau across the valley. You can return to Lauterbrunnen by mountain railway – the same way skiers and visitors to Mürren’s many hotels arrive – or take a long but gentle route on foot back down into the valley through woodlands and pasture. It’s possible to walk this route – there’s more in my guide to 4 breathtaking walks in the Bernese Oberland. Having seen Wengen in this distance yesterday, today is a chance to properly explore it. Wengen is the home of world-class skiing and a pretty smart town to boot. A steep walk of a couple of kilometres will take you from Lauterbrunnen to the centre of town, or take a quick train ride if you prefer. From here, you’re approaching the awe-inspiring triumvirate of the Eiger, Mönch and Jungfrau mountains. A train will take you all the way from Wengen to the snow-capped peak of the Jungfrau, or you can opt for some more spectacular hiking. We chose the latter and followed the lush, green route of the infamous Lauberhorn piste to Kleine Scheidegg, a railway mid-station at the cusp of the Lauterbrunnen and Grindelwald valleys, to take in the unbelievable views. 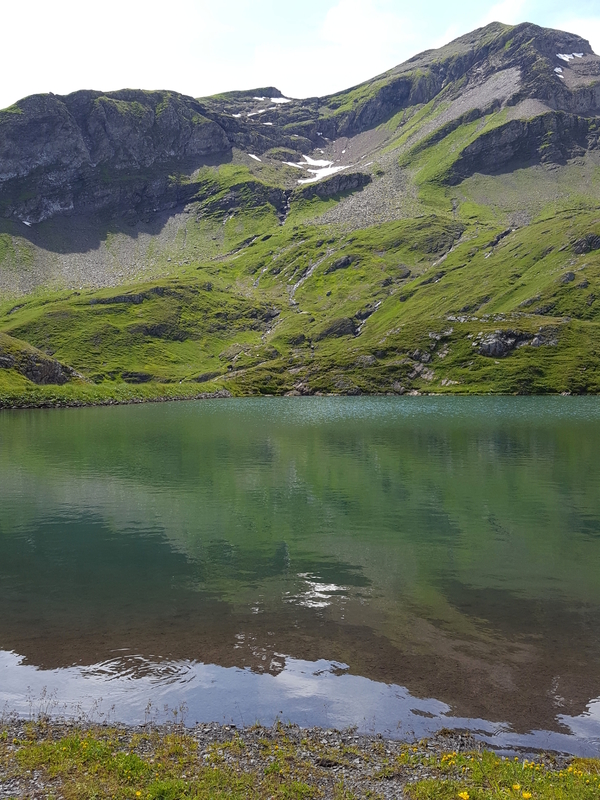 Find out more about beautiful walks from Kleine Scheidegg in 4 breathtaking walks in the Bernese Oberland. 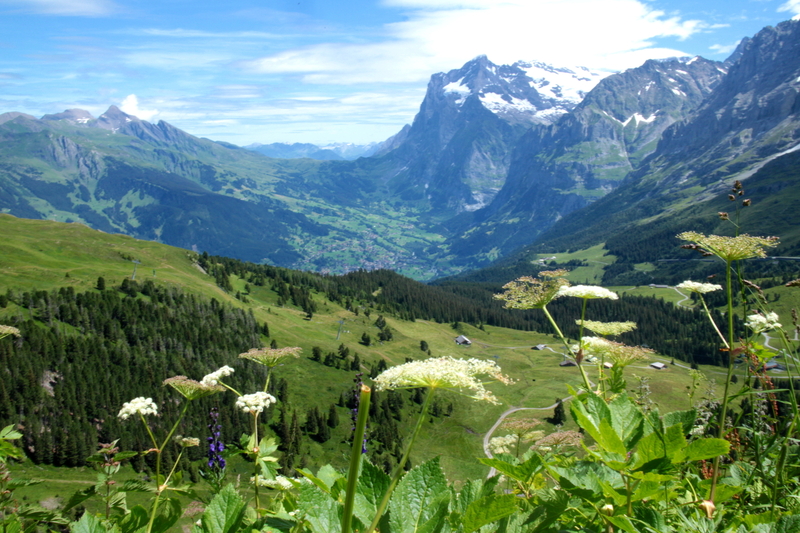 A full day in Grindelwald is a chance to pack in one last peak – ironically named First. There’s a cable car from the resort centre to this mountain top, with unrivalled views of the Eiger. It’s another dream hike if you’ve any life left in your feet, with more steep paths twisting their way through pasture and deciduous woodlands. 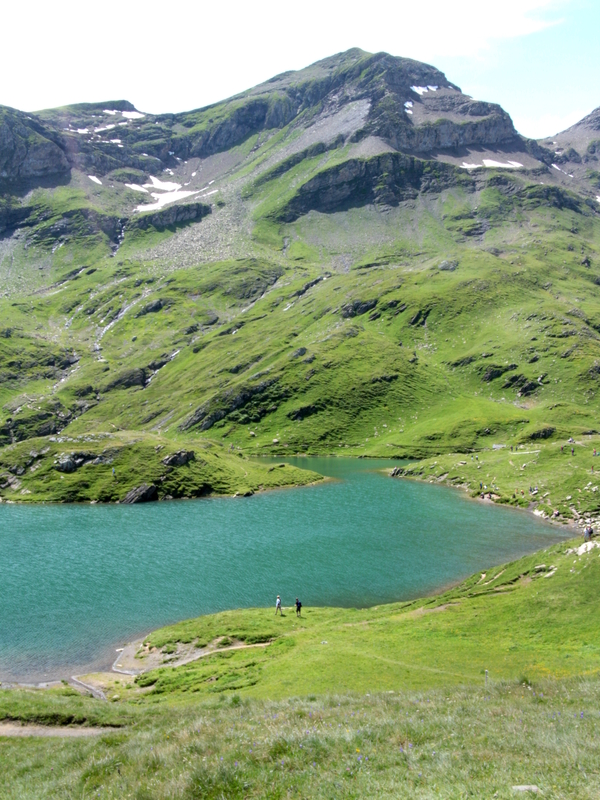 A short and relatively flat walk will take from First to Bachalpsee, a hidden gem at the top of Europe. A crystal-clear, azure blue glacial lake is nestled in the folds of the mountain, and will take your breath away. Watch the water trickle down in little rivulets into the flower drenched meadows below, and pick your way along rocky paths to some of the high alpine farmhouses tucked away from view. You might have guessed it, but there are some fantastic hikes to and from First too – check out 4 breathtaking walks in the Bernese Oberland for more spectacular scenery. It’s time to say goodbye, and promise you’ll be back. Make the most of a morning in Grindelwald if you can with a short stroll closer to town. If you’re heading back towards one of Switzerland’s transport hubs opt for a stop in the pretty lakeside town of Thun if you can. With colourful buildings packed in the medieval centre and traditional Swiss covered bridges galore, it’s a way to experience a different side to the Swiss landscape and culture. We flew to Geneva from London Gatwick with Easyjet at the end of July 2016. 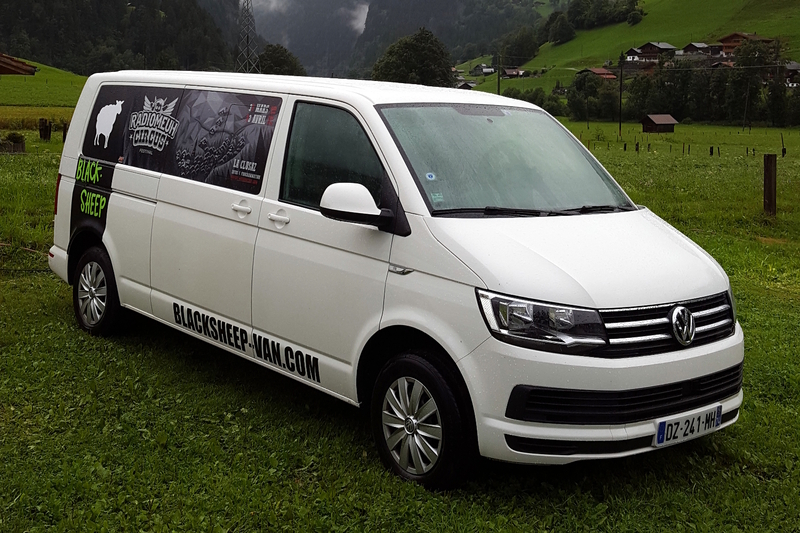 We hired a VW Caravelle campervan for the week from the lovely folks at Blacksheep Annecy (actually located in the charming little French town of La-Roche-sur-Foron, about half an hour from Geneva airport). From here we drove to Interlaken to begin our adventure. Easy to find, generous sized pitches (for a new van driver! ), a lovely view and wandering distance from the centre of Interlaken, Camping Jungfrau made a good base for our first few days. Set alongside the running river in the Lauterbrunnen valley, this old-fashioned campsite had everything we needed, with a generous side of river rapids and crashing waterfalls within arms reach. Highly recommended to us by friends, this didn’t disappoint. Incredible views of the Eiger plus no need to book – they’ll always make room for you.